Today, I am going to show you how to line an envelope so you can send letters to your friends and family in your own style. When you go to your mailbox, not your in-box, the mailbox outside your house or apartment, do you open the handwritten or personal envelopes first because you can’t wait to see who has written and why? Or do you hold those letters aside to enjoy after you are done sorting your bills and recycling the junk mail? 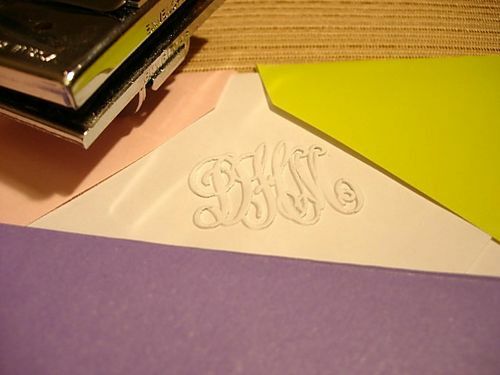 Whatever your approach, you no doubt recognize the importance of a letter that comes in a beautiful envelope with personal handwriting and a decoration or two. In our social media age, when even birthday greetings are sent by e-mail, the personal letter is truly a gift to savor and enjoy. I recently was cleaning out my attic and came across a box of old letters from college. They were from most of my girlfriends. I sat down to read them and got totally immersed in the magic of their written words. I was laughing and crying at some of the things I was reading. It was enlightening to say the least. I had such a good time reading them, that I made photocopies of all of them and sent them to my friends to read their own letters that they wrote a long time ago. They could not only reminisce, but they could see how far they have come, did they reach their dreams? Were they still the same person with the same values and ambitions? Reading all the letters made me think how I used to love getting letters, it was the only way my friends and I could connect, no e-mail, and phone calls were too expensive, so letters were how we not only expressed our thoughts but our style in the stationery we chose. Linda always used blue envelopes that had her beautifully scripted handwriting boldly written on the envelope. Steph had cute colorful note cards and had very small neat script. Her envelopes seemed to always have animals on them. Then there was Nancy who wrote on loose leaf ripped from a notebook with doodles all over it, stuffed into any envelope I think she could find. *Letters also changed my life. If it wasn’t for the art of letter writing, I wouldn’t have met my husband Ed. You can read about our story here. I collect stationery, I even have some since I was a kid that I used to use to write to my pen pal. My collection has accumulated over the years because I can’t pass up a stationery store without at least coming out with a box of adorable note cards that a salesperson placed in a cute little shopping bag with colorful tissue paper sticking out of the top. I love those little bags, they make buying something, no matter how small, feel so stylish. I firmly believe that adding your personal touch to everything you do makes the item or project much more interesting and a way to put your stamp on it. So with that in mind I decided to do a post about how to make a personal letter a bit more magical – a gift for the receiver to get excited about. I am going to teach you how to line an envelope. you can make your own very easily and inexpensively. 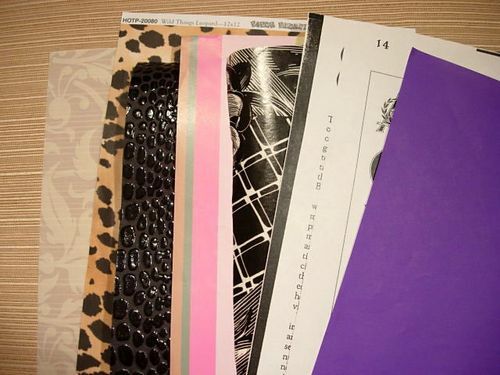 …with the addition of color and pattern to the inside of an envelope. All you need is some scraps of leftover scrapbook paper, wallpaper, gift-wrap, or a copy from a page in a book. Most of the papers I used to line the envelopes I had on hand, the black and white letters in the black dot note card is a photocopy from a page in a typeface book. 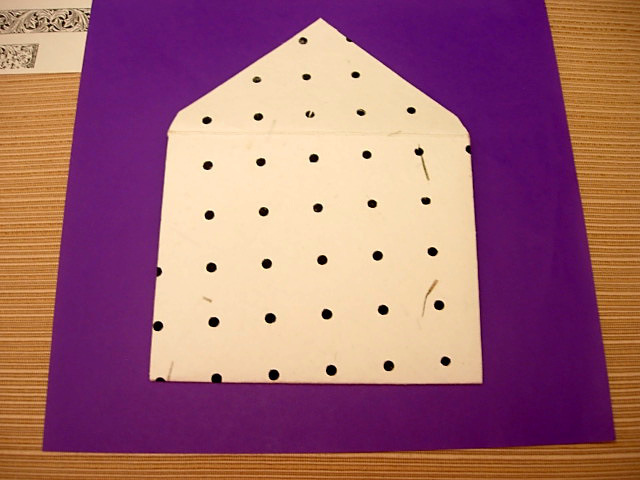 Lay the envelope onto the decorative paper and trace. Cut out inside the lines and trim as needed so when you place the paper liner in the envelope it lays flat. Cut 1/2″ from the bottom of the liner and then place in envelope so the gummy adhesive of the envelopes flap is not covered. 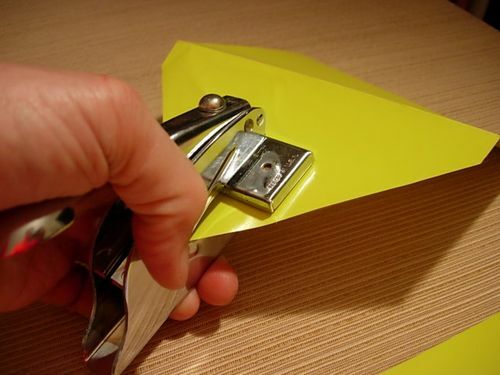 Use a glue stick to glue the liner to the inside of the envelope. I just put glue on the tab which holds the paper in just fine. I also like to press my monogram onto the back flap. I use a embosser with changeable plates. 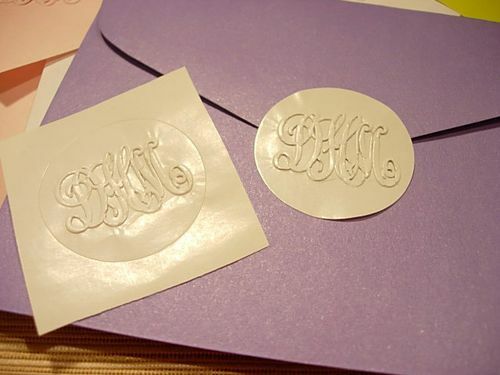 You can have them made with your initials or choose from many designs. You can personalize pages in books, stationery, seals and so much more besides envelopes. You simply put the paper between the two plates and press. You can find seals to emboss at office supply stores. 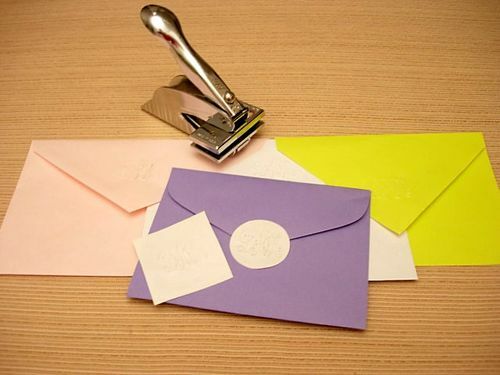 Now that you know how to line an envelope, do you know who you will send letters to? Do you do anything special to personalize your correspondence? Perfect idea for wrapping paper scraps, magazine graphics and old book pages. Many thanks! I too have a box of old hand written letters from my old friends at school. To be honest, I dont receive any hand written stuff anymore. How sad is that! I must do something about it. Thanks for the inspiration. I have one of these presses and forgot all about it. I will have to search it out and put it to some use. Your cards are lovely! First of all, I love your blog…how cute! Those cards are ADORABLE. Second, you seem to have this blog thing down better than I do – most thing confuse me. But I did create my header at Scrapblog. I saved it as a picture and added it that way. I also had put a picture of my bathroom on another post, as to not make my bathroom feel intimidated by those big and beautiful ones! I’d love some thoughts and suggestions! Happy Friday Follow! Your blog is gorgeous, I love it. This post was beautiful, letters mean the world to me! Hope you have time to stop by my blog too, can’t wait to see more from you. Hello! Stopping by from Friday Follow. What a treasure! Your blog is lovely and indeed inspiring. I love the quote you used to open this post. I quite agree! I love what you did with the envelopes and all your special touches. A well-crafted, thoughtfully written letter is such a gift ~ each element a piece of artisinal art ~ from the fine papers and embellishments, to the careful penmanship and genuine sentiments! new follower from Friday Follow. I think a personal note is so nice. I still send thank you cards for gifts. Thanks for visiting from Friday Follow! I am glad to hear you and your twin are close. I pray all the time that my girls will be best friends as they grow up! I love this post also…all that stationary is just gorgeous!! Funny, I found my letters in shoeboxes too. I am glad you hung onto them too. You should set aside some time and start reading them. It will be quite enjoyable. How pretty and unique! I love this idea. When I was in my early 20’s I was going to throw away the shoebox of letters I had from my high school friends. My mom convinced me to hang onto them, and reading your story I’m glad that I did! What a lovely post and LOVE how you finished the insides of the envelopes. I love getting letters, and definitely fit into that group that sets them aside so that I can savor them without interruption…. I mostly use stickers to embellish the letter and envelope. LOVE stickers and am always on the look-out for cute and pretty ones. I sometimes use scrapbooking ones too, they are often so pretty! But I only have my brother in Thailand and he is NOT a letter writer, never has been and never will duh. So I never receive one ;( BUT we Skype often lol. 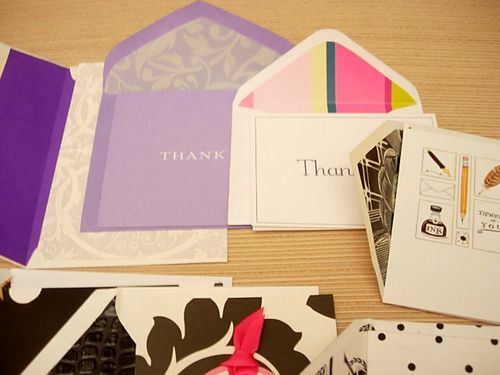 That is a great idea…what a fun treat to send someone not only a handwritten note, but beautiful envelope! I admit, I have not put much thought into personalizing my correspondence lately. I do have personalize embossed stationery that I use, but that’s it! You really gave me something to think about! I LOVE your blog. I’ll be back tomorrow am to read about the recycled cardboard valances…boy do I need help with window treatments!